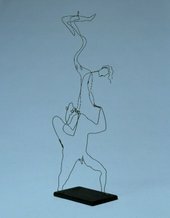 Alexander Calder, Acrobats, c. 1927, Calder Foundation, New York, Gift of Katherine Merle-Smith Thomas in memory of Van Santvoord Merle-Smith, Jr, 2010. 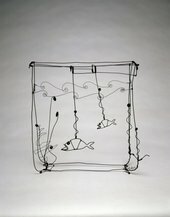 Artist Alexander Calder is best known for making sculptures that moved. In fact did you know that he invented mobiles? 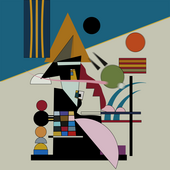 Check out these Alexander Calder artworks and get ideas for your own sculpture. 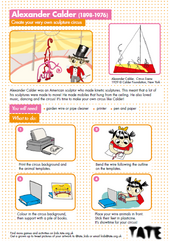 Download and print out this activity and create your circus. You will need 5 sheets of A4 paper in your printer. (Don't forget to photograph your creation when you've finished it and share it with Tate Kids).